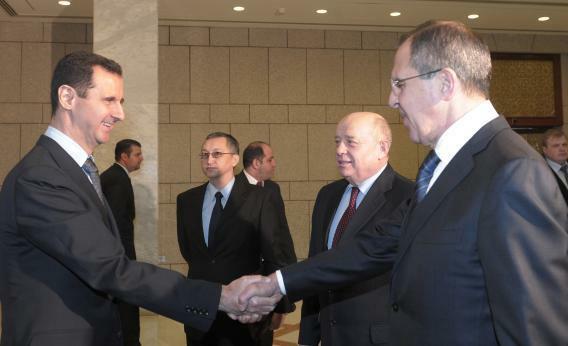 Syrian unrest: Russian Foreign Minister Sergei Lavrov visits Bashar al-Assad in Damascus. Russian Foreign Minister Sergei Lavrov’s visit to Syria was little more than a game of pretend. Actually, the time for “democratic reforms” has long passed in Syria, where Assad’s army shows no sign of “stopping violence regardless of where it may come from.” If anything, the brutality increased during the hours that Lavrov spent in Damascus. But even if Syria were an Arab Switzerland, fully prepared to hold a “constitutional referendum,” as Lavrov suggests, it would be hard to listen to the Russian foreign minister’s comments with a straight face. At the moment, it isn’t easy to say how, exactly, Russia selects its political leaders, but that process doesn’t involve the voting public, at least not very much. “Swift implementation of democratic reforms” is definitely an idea whose time has come—in Moscow and St. Petersburg as well as Damascus and Aleppo. Nevertheless, it is notable, and remarkable, that even the Russians now feel obligated to use this kind of language. I have to presume that Lavrov doesn’t care one way or the other about democracy in Syria: He went there because Syria buys a lot of weapons from Russia, because Russia was spooked by the fall of Muammar Qaddafi and because unrest in Syria might be bad for other Russian interests in the region. Once upon a time, a Soviet envoy visiting the beleaguered head of a client state in a similar situation would have used words like “comradely solidarity” instead of “democracy,” and he would have brought along some very visible military advisers for good measure. More to the point, even authoritarian regimes worry about how their warm relationships with other authoritarians look to those at home. Lavrov represents a regime that, although not endangered at the moment, certainly fears popular discontent, anti-corruption rhetoric and, of course, political demonstrations of the sort that created the Orange Revolution in Ukraine or the Arab Spring across North Africa. And thus Russia feels the need to maintain a semblance of legitimacy. During the last Russian presidential elections, President Dmitry Medvedev did not travel around the country and did not meet with supporters. The Russian media covered the story, with Medvedev receiving almost all of the television coverage while his opponents got little or none. Nevertheless, people were encouraged to vote, and all of the fluffy trappings of democracy were present, even though there was no doubt about who would win. The same is true in Russian diplomacy. Lavrov, and his bosses, clearly don’t want Russians back home to think they support a regime that is firing on demonstrators—although they do—particularly in a week when demonstrators have thronged the streets of Moscow, carrying banners calling for “honest elections.” It makes them look, well, undemocratic. So the Russian foreign ministry has to pretend to be fighting for Syrian democracy, even as the Syrian army is simultaneously waging a full-scale war against its people. On the other hand, people are not stupid: Syrians and Russians both know the difference between “democracy,” “constitutions,” and “referendums” on the one hand, and naked violence on the other. The more the Russians use those words, the more obvious it will be, to Syrians and to Russians, that in this context they are meaningless. Perhaps some of them will eventually decide they want the real thing instead.